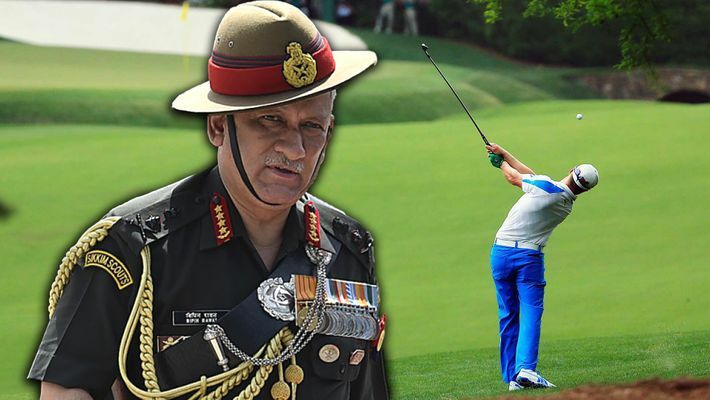 As a mark of respect for the soldiers and officers fighting against Pakistan and its terrorist groups in Kashmir, Indian Army chief General Bipin Rawat has ordered that Army golf courses be shut down for now in the Valley. The Army chief took the decision during a recent personal visit to Srinagar cantonment to pay homage to soldiers killed in an attack by Pakistan-based terrorist groups. “At the Badami Bagh Cantonment, the chief noticed that while he and several senior officers were waiting for the bodies, some officers seemed unfazed by the deaths; they continued to play golf at the Army facility there,” a top Army source told My Nation, requesting anonymity. “Given the insensitivity, the Army chief has decided to put a stop to golf for now,” he said. If anyone deployed in the 15 Corps area now wants to play golf, they can go to a nearby civilian facility and pay and play there. However, there will be no club-swinging at the Army golf courses. Army sources say most of the officers deployed in the 15 Corps headquartered in Srinagar, looking after counter-terrorism operations, don't get time to play the game, which is viewed as elitist in the force. The officers who used to play golf at the Army course included some who were posted in non-operation roles. A handful of officers were not happy with the decision. But a majority were happy as it looked insensitive to play golf in an intense conflict zone. Sources said golf had been banned in the Valley earlier as well. After the Uri attack in which India lost 20 soldiers, General Dalbir Singh Suhag had asked officials to immediately stop the game, but it was implemented only in Uri. Golf has also been a contentious issue between the Army and the government. The Comptroller and Auditor General have, on several occasions, red-flagged around 100 golf courses created by the Army in different parts of the country. These courses have now been renamed as “environmental parks” by the military to avoid the scrutiny by the central government and audit agencies. These courses are generally used by officers. Jawans have to go through a lengthy process before getting to play there, an Army source said.